The new series of Top Gear has been caught up in more controversy amid claims producers inserted ‘canned laughter’ to cover up ‘awkward silences’. Sound effects of hysterical laughter were allegedly used to make jokes sound like they landed despite deadpan looks on the faces of the audience. 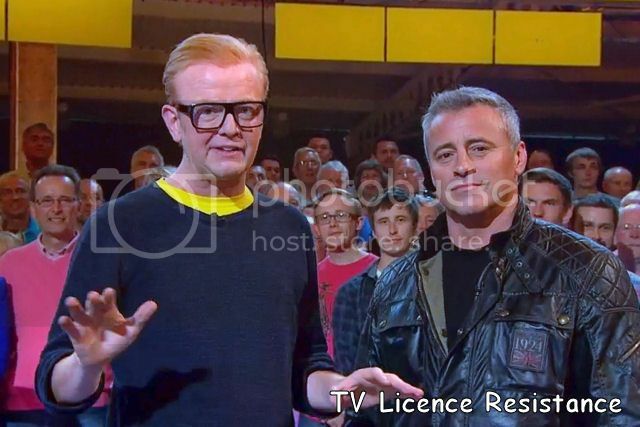 The new series, fronted by Chris Evans and Friends actor Matt LeBlanc, has been slated by critics while it only drew 4.3million viewers – the lowest figures for a series debut in more than a decade. It comes as leaked BBC audience data supposedly ranked the show as the ‘worst’ on terrestrial television last weekend. Laugh tracks were allegedly inserted when Evans made a joke about catering – a reference to the sacking of former host Jeremy Clarkson – and when LeBlanc made a quip about Top Gear remaking Lawrence of Arabia. On both occasions, audience members visible in shot remained nonplussed, but ‘hysterical laughter’ could be heard in the background. At one point during filming, Evans also had to ask the crowd to laugh if ‘they found things vaguely funny’. One guest who attended the shoot told The Sun: ‘There were so many long, awkward silences. But when I watched the show back I just couldn’t believe how much laughter they had added in. The guest added much of the audience was ‘bored out of their minds’ rather than ‘being in stitches’ as the televised programme suggested. Meanwhile, according to the Daily Telegraph, the BBC’s Appreciation Index (AI) gave the show a score of 60, 22 points lower than its average rating. The index works by polling 5,000 people, who give a programme a score out of 100, with the higher the result reflecting ‘higher quality’. No other show had as low a rating as Top Gear, which is said to have matched the short-lived ITV morning show Daybreak, widely panned by critics before it was scrapped in 2014. The final Top Gear series under Clarkson, James May and Richard Hammond is understood to have ranked in the 80s. A BBC source told the Telegraph it was not concerned and said: ‘Programmes traditionally start low and improve as the viewers who don’t like it leave and viewers who enjoy it stay. LeBlanc has distanced himself from criticism over the show’s filming of stunts near the Cenotaph memorial in Westminster, telling a New Zealand reporter ‘We didn’t do anything that wasn’t agreed, allowed or accepted’. The show has been beset by claims of infighting between the hosts, as well as reported clashes between Evans and the producers, with executive producer Lisa Clark leaving after just five months amid reports of creative differences with the former Big Breakfast presenter. Since then, several former colleagues of Evans have made allegations of ‘bullying’ against him. More recently, the Cenotaph incident has led to claims of a rift between LeBlanc and Evans, with the 48-year-old American feeling ‘stabbed in the back’ by Evans’ reaction, according to reports. According to The Sun, the BBC has drawn up a contingency plan to replace Evans despite giving him a three-year contract to host the show. A source close to the programme told The Sun the ‘magic it had under Clarkson had gone’ and that the BBC ‘is working out a Plan B if they decide to get rid’. Evans was criticised for being ‘shouty’ during the first episode while LeBlanc drew praise for his ‘cool’ approach. The BBC are also said to have abandoned a £250,000 supercar film shoot in Norway involving a Ferrari and Lamborghini after police told them not to break a 50mph speed limit. Corporation bosses are now said to be ‘desperate’ to extend LeBlanc’s Top Gear deal despite his commitment to filming CBS comedy Man With a Plan about a house husband who finds taking care of his three children is much harder than it seemed. But the actor is understood to be unsure about returning because he ‘doesn’t want the hassle’. Evans has continuously denied claims of the rift with LeBlanc and, as previously reported, also hit back at the bullying claims. Speaking to Event magazine, he said he was revved up and roaring to take on his critics. Evans said: ‘You can’t lose if it looks like you’re on to a total loser from the outside. A lot of people have written the show off before it’s hit the air. He also hit back at claims he was a ‘control freak’ that circulated when executive producer Lisa Clark resigned from the show after just five months. He said: ‘I honestly don’t think I am. Control freak, tyrant, call it what you want. LeBlanc, who made his name as Joey in Friends, was also said to have been spotted with his ‘head in his hands‘ looking ‘drained and fed up’ by the production.